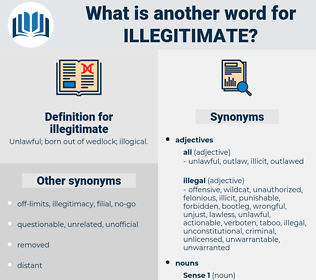 What is another word for illegitimate? Unlawful; born out of wedlock; illogical. 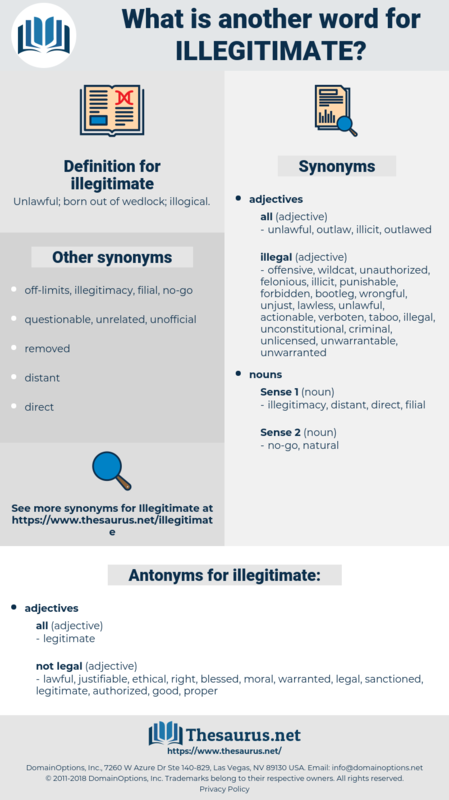 spurious, ill-gotten, irregular, unjustified, unauthorised, inappropriate, unjustifiable, unnatural, lawful, anti-illegal, unjust, legitimacy, clandestine, unfounded, unreasonable, extrajudicial, licit, unauthorized, Unapproved, abusive, rightful, fraudulent, invalid. justifiable, ethical, moral, good, sanctioned, right, proper, legal, lawful, warranted, authorized, blessed. enlightened, solid, informed, endorsed, correct, validated, supported, persuasive, corroborated, sober, virtuous, clear, licensed, encouraged, seemly, organized, sane, substantiated, righteous, decorous, demonstrated, sensible, compelling, commonsense, credible, principled, approved, cogent, confirmed, reasoned, sure, wise, convincing, satisfying, ordered, permitted, certain, suggested, plausible, true, established, decent. Judith Westmore had the southern aristocrat's pitiless contempt for the illegitimate. Our laws, with relation to illegitimate children, are more than unjust - they are inhuman.